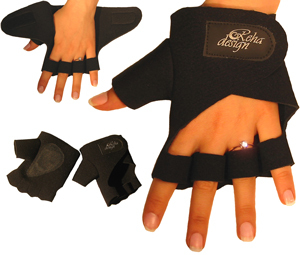 Are you a quadriplegic or someone with limited hand dexterity looking for a durable glove for active wheelchair use? Look no further. After listening to quadriplegics and other wheelchair users with hand dexterity issues, we developed a leather glove for active wheelchair use. A leather wheelchair glove that is easy to put on, improves grip and is flexible. 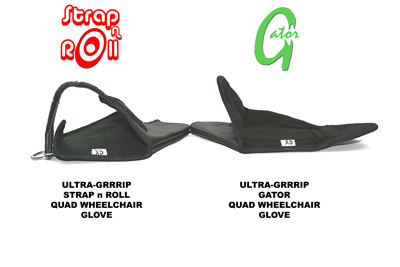 * Strap n Roll Quad Wheelchair Glove: closes with a strap. Some quadriplegics prefer a glove which closes with a strap because it closes easily. 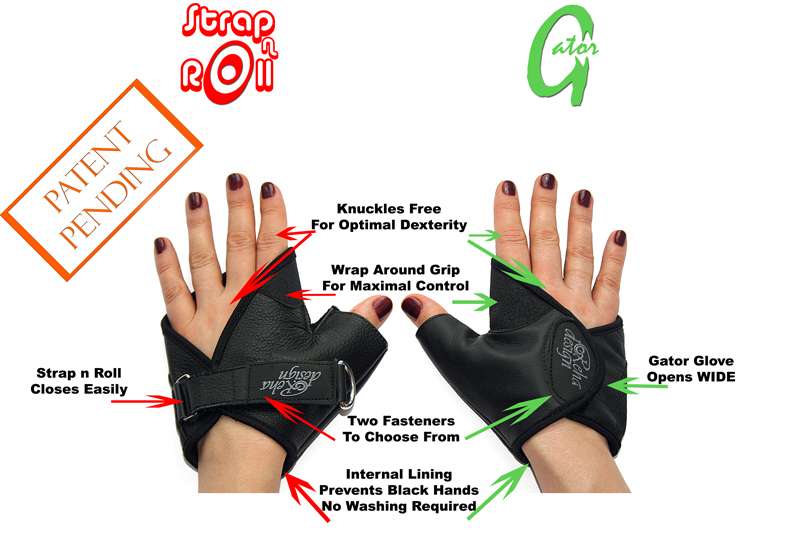 * Gator Quad Wheelchair Glove: closes with "hook and loop" system. Some quadriplegics prefer a glove which closes with hook and loop, because it opens WIDE. Both Gloves leave the knuckles free. Quads with some hand will notice that these gloves offer maximum grip with maximal impact on hand flexibility. One way we do this is by leaving the knuckles free on the back of the hand. Both Wheelchair Gloves feature a large grip pad on the palm, made of texturized leather. This sturdy grip pad covering more than half of the palm is important for pushing and stopping the wheelchair. Both Wheelchair Gloves feature an upper grip pad for control. Use this grip pad to turn and adjust the movement of the wheelchair. 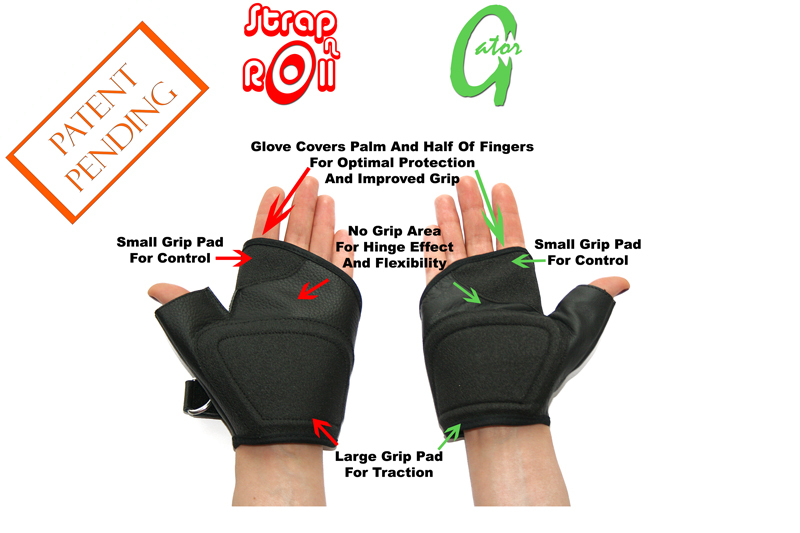 Both Wheelchair Gloves feature a "no grip area" between the two grip pads. Wheelchair users with some hand dexterity will find that this "no grip area" allows the glove to bend easily giving a "hinge like effect". It also helps to place the grip pads ideally around the push rim and gives improved grip. These wheelchair gloves come in sizes for nearly everyone, including wheelchair gloves for kids and wheelchair gloves up to size XXL. * Step one determine your size by consulting our sizing chart. * Step three click "Add To Cart"
* Step four, pay securely with Paypal. For quads looking for a lightweight wheelchair glove with maximum flexibility, consider RehaDesign Flexi-Fit Quad Wheelchair Gloves. Made of soft neoprene and with a textured pad on the palm for traction, these Quad wheelchair gloves will not restrict your hand movement. Flexi-Fit open wide so that you can easily insert your hand. Flexi-Fit wheelchair gloves are excellent for use around the house. For more active outdoor use, wheelchair users are advised to see Gator or Strap n Roll Leather gloves above.